In years past the National Observance was held during the day, however, this year it has been moved to prime time, beginning at 7:30PM, ET. According to the National Day of Prayer website, a link to the live feed of the event will be provided at that time, by clicking here: www.god.tv/liveevents. As our nation struggles with foreign and domestic threats, economic insecurity, cultural tensions, and continual challenges to basic constitutional rights, citizens of the United States are preparing to heed the call by our elected leaders to exercise one of their most precious freedoms—the right to gather, turn to God, and pray. In response, millions will assemble at thousands of local events across the nation, where they will take time out of their daily schedules to intercede on behalf of their communities, their nation, and their leaders. Best-selling, award-winning author and speaker, and founder and president of AnGeL Ministries, Anne Graham Lotz, serves as the Chairperson of the National Day of Prayer, and will give the keynote address at the National Observance in Washington, DC. To learn more visit www.NationalDayofPrayer.org. 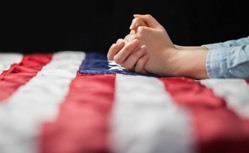 The National Day of Prayer tradition pre dates the founding of the United States of America, evidenced by the Continental Congress' proclamation in 1775 setting aside a day of prayer. In 1952, Congress established an annual day of prayer and, in 1988, that law was amended, designating the National Day of Prayer as the first Thursday in May.